Mike Mansfield, a quiet man who led the Senate longer than any other person in history, was eulogized Wednesday as one who gently used the power of his office. 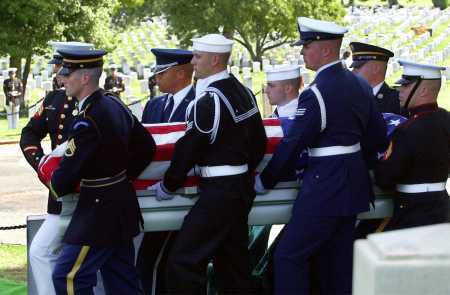 More than 400 people filled a sunny Fort Myer Memorial Chapel near Arlington National Cemetery for the 45-minute service. President Bush had ordered flags lowered to half-staff at federal buildings around the country in honor of Mansfield. Mansfield, a Democrat, died Friday at age 98. He presided over the Senate from 1961 to 1976, a time in America marked by strife over Vietnam, civil rights and White House scandals that brought down President Nixon. 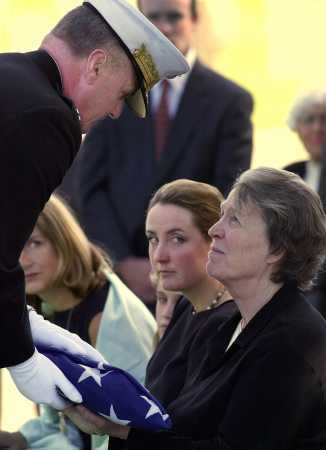 casket of former Senate Majority Leader Mike Mansfield to Mansfield's daughter Ann Mansfield during funeral service at Arlington National Cemetery in Arlington, Va. Wednesday, Oct. 10, 2001. O'Conner, partially hidden, granddaughter Carolyn Marris and Ann. President Bush ordered flags lowered to half-staff at federal buildings around the country Wednesday in honor of the late Mike Mansfield, who rose from the Montana copper mines to become the longest-serving majority leader in Senate history. Memorial services for Mansfield, who died Friday at age 98, were planned for Wednesday at Fort Myer Memorial Chapel, adjacent to Arlington National Cemetery, where Mansfield will be buried. He will be eulogized by Charles Ferris, a longtime friend and formerly his legal counsel when he served in the Senate. Mansfield, D-Mont., presided over the Senate from 1961 to 1976, a time in America marked by strife over Vietnam, civil rights and White House scandals that brought down President Nixon. 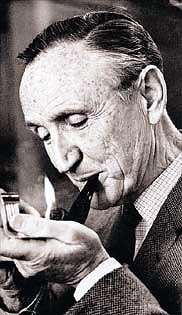 "Mike Mansfield was a leader in extraordinary times. He was the sage, laconic captain with his hand firmly on the wheel,'' Sen. Max Baucus D-Mont., said Tuesday in a speech on the Senate floor. As majority leader, Mansfield's calm and respectful manner spread a balm over a Senate inflamed by suspicion and demanding egos. His cool style was credited with steering landmark civil rights legislation and the Voting Rights Act to passage, and prodding the Senate to investigate the Watergate break-in that eventually drew Nixon's resignation. He served 34 years in Congress, 24 of those in the Senate. When he left the Capitol, he remarked that he had witnessed the work of seven presidents, the assassinations of President Kennedy and Robert F. Kennedy, and the dawn of the nuclear age. "Thirty-four years is not a long time, but it's long enough,'' Mansfield said in a farewell speech from the Senate. Mansfield's public career began anew in 1977 with his posting to Japan as ambassador under President Carter. Mansfield became highly popular in Japan, so when the White House changed parties, President Reagan asked him to stay in the job. Mansfield remained in Tokyo for 11 years, overseeing relations between the Pacific nation and the United States when Japan was building its economy into a dominating force. Mansfield was born in New York City's Greenwich Village to Irish immigrants. His father, a hotel porter, sent the 3-year-old off to live with relatives in Montana after his mother died. He quit school at 14 and lied about his age to join the Navy and fight in World War I. He also served in the Army and the Marines. After the war, he returned to Montana and worked in a copper mine. He married Maureen Hayes, a schoolteacher who urged him to take a special exam and enroll in the Montana School of Mines in 1927. He eventually got a master's degree and became a professor in Far Eastern history and a consultant to presidents. After stepping down as ambassador in 1988, Mansfield went to work as a Far East consultant for investment banking firm Goldman Sachs and Co.
Mike Mansfield, the Montana Democrat who served as the Senate's majority leader from 1961 to 1977, died Friday, 5 October 2001, according to Walter Reed Army Medical Center. He was 98. Mansfield was born to Irish immigrant parents in 1903 in New York. His mother died when he was 3 years old and he was sent to Montana to live with relatives. According to a biography posted on the Senate Web site, he attended public schools in Great Falls; he served as a seaman when he was only 14 years old in the U.S. Navy during World War I and later served in the Army and the Marine Corps. He worked as a miner and mining engineer in Butte from 1922 to 1930 and attended the Montana School of Mines at Butte in 1927 and 1928. Mansfield graduated from Montana State University at Missoula in 1933 and received a master's degree from that institution in 1934. He was a professor of history and political science at the Montana State University from 1933 to 1942. He was elected as a Democrat to the 78th Congress. He was re-elected to the four succeeding sessions of Congress -- January 3, 1943 through January 3, 1953. He was not a candidate for re-election in 1952, having become a candidate for the Senate. He was elected to the U.S. Senate in 1952. He was re-elected in 1958, 1964, and again in 1970 and served from January 1953 to January 1977. Lyndon Johnson, then a Texas senator, chose Mansfield to be his majority whip in 1957, largely because he was a respected moderate western Democrat. But it was Mansfield who came to be President Johnson's most insistent and troublesome congressional critic on America's role in the Vietnam War. In 1961, the Senate elected Mike Mansfield its majority leader, a post he held for 16 years -- longer than anyone in Senate history. His career in the Senate included active membership on the Senate Foreign Relations Committee, a strong advocacy of national health insurance, an early and principal supporter of lowering the voting age to 18, a leading role in the 1964 Civil Rights Act and the Voting Rights act of 1965, and leadership in establishing the Fairness Doctrine and the right of Congress to respond to major presidential policy statements. Upon retiring from the Senate in 1976, Mansfield was appointed U.S. ambassador to Japan by President Carter. In an unusual move, Republican President Ronald Reagan reappointed the Democrat to the position. Mike Mansfield, 98, a self-effacing and down-to-earth Montana Democrat who retired in 1977 after 24 years in the U.S. Senate, 16 of them as majority leader, and who served as ambassador to Japan from 1977 to 1988, died yesterday at Walter Reed Army Medical Center. He had congestive heart failure. Mansfield served as ambassador and majority leader during important periods -- and held each job longer than any of his predecessors. He was Senate majority leader at a time of mounting congressional opposition to the war in Vietnam and the authority of the president to conduct war, as well as the Watergate crisis and the resignation of President Richard M. Nixon. And his ambassadorship in Tokyo, one of the most sensitive posts in U.S. diplomacy, coincided with the years in which Japan established itself as one of the world's economic superpowers and built a staggering trade surplus with the United States. In all, Mansfield's career in public life spanned five decades. It began in 1942 with his election to the House of Representatives, where he spent a decade before winning election to the Senate in 1952. He served as Democratic whip from 1957 to 1961, when he was chosen for the pivotal post of majority leader at the personal request of the newly elected President John F. Kennedy. Intending to retire after deciding not to seek reelection to the Senate in 1976, Mansfield changed his mind at President Jimmy Carter's urging and accepted the post in Japan. He was retained as ambassador throughout the Reagan presidency and resigned in 1988 at the age of 85. President Bush noted Mansfield's death "with sadness," saying in a written statement, "He will be sorely missed, but his legacy of service to the United States will continue." Senate Majority Leader Thomas A. Daschle (D-S.D.) recalled Mansfield as "my friend, my teacher and a leader whom I try to emulate," adding that "the Senate never had a finer leader." Senate Minority Leader Trent Lott (R-Miss.) remembered him as one of the Senate's giants. been on Asian fact-finding missions for six U.S. presidents. He was a junior member of the House of Representatives in 1945 when President Harry S. Truman sought his advice on terms of the Japanese surrender that ended World War II. Mansfield counseled the president to permit the Japanese to keep their emperor, a concession that proved to be vital to the success of the postwar peace agreement. In 1987, when Japanese Crown Prince Akihito and the Crown Princess Michiko visited the United States, Mansfield took the unusual step of accompanying the imperial couple on their Japan Airlines jet across the Pacific and at every stop on their tour of the United States. When he returned to the United States after 11 years in Tokyo, the Japanese ambassador to this country said Mansfield "could have run for prime minister and won." He preached a gospel of free trade on both shores of the Pacific and pestered Japanese bureaucrats to lower trade barriers to U.S. products while discouraging anti-Japanese sentiment in the United States. Although generally given credit for having helped ease the tensions generated by competing U.S. and Japanese economies and the trade imbalance, Mansfield was sometimes accused by U.S. business and labor interests of being overly protective of the Japanese. As the Senate's majority leader, he had a low-key style of management that was often described as "effective without being oppressive." In contrast to his predecessor, Lyndon B. Johnson (D-Tex. ), he never twisted arms, browbeat or threatened other senators to get his way, relying instead on respect, accommodation and persuasion. This sometimes drew complaints that his leadership was too passive. But Mansfield argued that each senator was entitled to conduct his business with minimal pressure from the leadership, and he was reluctant to force his convictions on others. Once, when a newspaper editorial called his leadership a "tragic mistake," Mansfield declared in a speech on the Senate floor, "if that means that I am neither a circus ringmaster, the master of ceremonies of a Senate nightclub, a tamer of Senate lions, or a wheeler and a dealer, then I must accept the title." He delegated authority and encouraged the Senate's committee chairmen to floor-manage their own bills, reasoning that because these were the men who knew most about their content, they were best equipped to guide them to enactment. He also encouraged younger senators to speak their minds, and he helped move them into positions of authority, breaking with a long-standing Senate tradition that new members should remain silent and defer to their seniors for four or five years. In the process, he democratized the Senate. It came to be less dominated by a small and exclusive inner club of older men. It was said of Mansfield that he changed the attitude and character of the institution as much as any leader in its history. His most significant Senate achievements, Mansfield said on leaving Capitol Hill, were initiating the Watergate Committee whose investigations led to President Nixon's resignation and his roles in winning passage of extending voting rights to 18-year-olds and in creating the committee that investigated abuses by the CIA. A foe of the Vietnam War, he regretted that he "never was able to stop it or slow it down." He lacked the eloquence of such Senate contemporaries as the late Senate Republican leader, Everett McKinley Dirksen (Ill.), and he could never match the nimble wit of Hugh Scott (Pa.), who succeeded Dirksen as Republican leader in 1969. Mansfield's most frequent answers to questions from the media were "yep," "nope," "maybe" and "don't know," which did not endear him to the producers of television news talk programs. A large bureaucracy made Mansfield uncomfortable, so he kept his office staff small and employed no press secretary. He did use the chauffeur-driven limousine that went with the job of majority leader, and he often drew chuckles when he used the car to visit a free public golf course or a cut-rate clothing store where it was sometimes said that the hue of the suits he purchased would have depressed a mortician. unsatisfactory, he replied that the man had once done him a favor and that winning the election was not worth hurting his feelings. He tried to schedule Senate business so that senators could get home for dinner on time, and he was known to keep Cabinet officers waiting while he visited with his constituents. All mail from his constituents was answered, and he read and signed every letter himself. He dropped out of school before finishing the eighth grade. Shortly before his 15th birthday, he lied about his age and enlisted in the Navy. He served during World War I and crossed the Atlantic seven times on a military transport before the Navy discovered he was underage and discharged him. Later, he served a year in the Army in California. In 1920, he joined the Marine Corps and during the next two years served in the Philippines, China and Siberia. Returning to Montana in 1922, Mansfield took a job as a "mucker," shoveling rocks and dirt half a mile under the ground in a copper mine near Butte. Five years later, while still working in the mines, he enrolled as a special student at the Montana School of Mines. While there, he met his future wife, Maureen Hayes, a Butte schoolteacher who persuaded him to complete his high school education by taking correspondence courses. instructor. During the summers of 1936 and 1937, he did additional graduate study at the University of California at Berkeley and was subsequently appointed a full professor of Far Eastern and Latin American history and political science at Montana. Representatives from the congressional district that included the mining region in the western part of the state. Two years later, he ran again for the same seat, winning this time in an election to fill the seat being vacated by the retirement of Republican Rep. Jeannette Rankin. He was assigned immediately to the Foreign Affairs Committee, then in 1944 was sent on a confidential fact-finding mission to China by President Franklin D. Roosevelt. Returning in January 1945, Mansfield reported to the president that he found China a deeply divided and demoralized nation. He would later observe that the collapse of Sino-American relations following the Communist takeover on the Mainland was one of the great failures of U.S. foreign policy. As a member of the House, Mansfield backed the extension of price controls, the immigration of persons displaced by World War II to the United States, increases in the minimum wage, economic aid to Greece and Turkey and the Marshall Plan for the economic rehabilitation of postwar Europe. He opposed the peacetime draft, the Taft-Hartley Act and poll taxes. In 1952, he challenged Montana's incumbent Republican Sen. Zales N. Ecton. He narrowly won in what turned out to be a heated campaign that included visits to Montana by Wisconsin's Communist-baiting Republican Sen. Joseph R. McCarthy, who accused Mansfield of "Communist-coddling practices." The new senator was assigned a seat on the Foreign Relations Committee, which in 1953 sent him on a fact-finding mission to Indochina, where the war between the French colonialists and the Viet Minh was in its final stages. The following year, he was the Senate's Democratic Representative at the Manila Conference that established the Southeast Asia Treaty Organization. leader when Johnson became vice president in 1961. Although he had supported Johnson over Kennedy for the Democratic presidential nomination in 1960, Mansfield had a close and warm relationship with Kennedy during his presidency. After Kennedy's assassination in 1963, he delivered an emotional eulogy during a Capitol Rotunda memorial service, which was broadcast on national television. Mansfield was one of the first prominent Americans to voice concern about developments in Vietnam, warning both the Eisenhower and Kennedy administrations that no government in Saigon could succeed unless it were based on social justice and popular with the people. reductions in Europe and South Korea, arguing that having military forces on the scene increased the likelihood that they would be used. Despite his strong disagreements with White House policy, Mansfield took pains to maintain civil relations with the presidents during his years as majority leader. His relations with Nixon were cordial although not close, but they did have breakfast once a month during Nixon's presidency. His appointment as ambassador to Japan, just months after his retirement from the Senate, was widely greeted in Japan as an indication that President Carter recognized the critical importance of Japan to the United States and in the world. In the Japanese media, Mansfield became known as "omono taishi," or "big-name ambassador." He found the pace of life as ambassador less hectic than it had been in the Senate, but he was ready for a lifestyle where he would be appreciated as a wise elder whose many Washington connections would be valued by high officials in Japan. In time it would be said of Mansfield that he had the best of both worlds, officially the U.S. ambassador to Japan, but also thought of by many Japanese as their ambassador to the United States. On retiring as ambassador, Mansfield was awarded a Presidential Medal of Freedom, the nation's highest civilian award. After his ambassadorship, he served for a time as a senior adviser on East Asian affairs to Goldman, Sachs & Co., the Wall Street investment banking firm. Maureen Mansfield, whom he married in 1932, died in 2000. Survivors include a daughter, Anne Mansfield Marris of London; and a granddaughter. Mike Mansfield, who served as Senate majority leader longer than anyone else and was instrumental in the 1960's and 1970's in the enactment of legislation on civil rights, social policy and foreign affairs that changed the course of the country, died today at Walter Reed Army Medical Center. He was 98. Mr. Mansfield lived in Washington and went to his office at Goldman Sachs Group almost every weekday until last week, when he went into the hospital, said his assistant, Barbara Hickey. A Democrat from Montana, Mr. Mansfield was in the House of Representatives for 10 years and in the Senate for 24, 16 of them as majority leader. He left the Senate in 1977, ready to retire to Montana. But he was quickly named ambassador to Japan, and he held that post for 10 years, also longer than anyone else. In Congress, where bombast and pomposity are common, Mr. Mansfield was unusually modest and self- effacing. "He's the most decent man I've ever met in public life," said former Senator Hugh D. Scott Jr. of Pennsylvania, who was the Republican minority leader when Mr. Mansfield retired as majority leader. In Japan, where he served both Democratic and Republican presidents, Mr. Mansfield was a revered figure. He did not hesitate to tell the Japanese when he thought American patience was running out. But he also spoke out when he thought Americans had criticized Japan unfairly. A few days after his 95th birthday, in March 1998, Mr. Mansfield expressed in an interview his philosophy of moderation and accommodation, which characterized his career as a politician and as an envoy. "Differences can be bridged, solutions can be found, concessions can be made," he said. "It's much better to take an inch than to take nothing at all. I don't believe that winning is everything, though it's very desirable. I don't think there's anything wrong in losing if you do it the right way." At the time of the interview, Mr. Mansfield was vigorous and informed, with a straight back, a quick step and a strong voice. The week after his 95th birthday, he inaugurated a lecture series on leadership sponsored by the Senate Republican leader, Trent Lott of Mississippi. Mr. Mansfield's distaste for partisan warfare often frustrated his more aggressive Democratic colleagues in the Senate, and his brand of leadership sometimes seemed ineffective compared with the strong- arm style of his predecessor as majority leader, Lyndon B. Johnson. But after President John F. Kennedy was assassinated and Vice President Johnson became president, Mr. Mansfield guided the Senate toward passage of a spate of civil rights, health, education and antipoverty legislation that Johnson called the Great Society. His leadership was essential in the passage of the Civil Rights Act of 1964, which outlawed discrimination in all public accommodations, and the Voting Rights Act of 1965, which made possible the widespread participation of Southern blacks in state and federal elections. Ross K. Baker, a political scientist at Rutgers University, calls this period "one of the golden ages of the U.S. Senate." Senator Mansfield's legacy, Professor Baker said, is that he sapped the influence of the inner club of a few powerful senators and "allowed the modern Senate of equals to emerge." The current Senate majority leader, Tom Daschle of South Dakota, said today, "The Senate never had a finer leader." Mr. Mansfield had strong personal views on many subjects, and he never hesitated to express them, even when he was at odds with presidents and many of his Democratic colleagues. This was especially true in the war in Vietnam. He supported the increasing United States involvement in Vietnam in 1961 and 1962, but became an implacable critic of the American position after the assassination of President Ngo Dinh Diem of South Vietnam in November 1963. Year after year, he backed legislation to withdraw troops and stop the bombing. In 1973, he was a principal architect of the War Powers Act, which was designed to check the president's ability to commit American troops abroad without the consent of Congress. Mr. Mansfield often said he was proudest of the central role he played in winning Congressional approval of legislation that led, in 1971, to ratification of the 26th Amendment, which gave 18-year-olds the right to vote. Throughout it all, he was remarkably taciturn, his statements often limited to "Yep," "Nope," "Maybe" or "Can't say." In the 1998 interview, Mr. Mansfield said he worried about the political polarization that had developed in the country generally and in the Senate especially. "I've always felt," he said, "that the true strength of the Senate lay in the center, not on the right and not on the left, but with those people who could see both sides and were not so convicted of their own assumptions that they wouldn't listen to the other side." Less than a year after he retired from the Senate, Mr. Mansfield, at 74, was named by President Jimmy Carter to be ambassador to Japan. In 1981, when Ronald Reagan became president, Mr. Mansfield began packing his belongings. In the interview, he described what happened next: "The phone rang at 2 o'clock one morning, and I wondered who the hell is calling at this hour. It was President Reagan. He said, `I'd like you to stay on.' I said, `I'm half packed, ready to go.' He said, `Unpack. I want you to stay on.' So I said, `Hang on a minute,' and I woke up Maureen. And she said, `Yes,' and so I said, `Yes,' and so we stayed on for eight more years." In Tokyo, Mr. Mansfield presided over some tense times in a relationship that he liked to call "the world's most important, bar none." In his tenure, the United States and Japan clashed over trade issues involving items including automobiles and television sets, telecommunications equipment and beef. Mr. Mansfield also argued the American side in disputes over whether Japan hurt Western security interests by selling machine tools to the Soviet Union and differed with the Japanese on just how much Japan should spend to help its economy, pay for its own defense and dispense in foreign aid. In many ways a prototypical rough-hewn, laconic Westerner, Mr. Mansfield was born in the East and had a hard, sad childhood. Michael Joseph Mansfield was born on March 16, 1903, in New York City, the son of Irish immigrants. His father, Patrick, was a porter in a Greenwich Village hotel. His mother, the former Josephine O'Brien, died when he was 3, and the boy was sent to live with an aunt and uncle who owned a grocery store in Great Falls, Mont. As soon as he was able, Michael was working, pushing his uncle's delivery cart around Great Falls. He was an unhappy boy and ran away from home several times. "I hopped freight cars and got sent home twice, and once I spent the night in jail," he recalled. After lying to recruiters about his age — he was a month shy of 15 at the time — he joined the Navy shortly before the United States entered World War I and served in the Atlantic. After the war, he served in the Army for a year, and in 1920 he enlisted for two years in the Marine Corps. The Marines sent him to the Philippines, Japan and China, awakening a lifelong interest in the Far East. Returning to Montana in 1922, Mr. Mansfield worked as a "mucker" in the copper mines of Butte, using a pick and shovel to clear away rock and debris in shafts half a mile underground. In Butte he met a schoolteacher, Maureen Hayes, who persuaded him to enter the Montana School of Mines, though he had not finished the eighth grade. Mr. Mansfield enrolled as a special student and took college courses and high school correspondence courses simultaneously. He and Miss Hayes were married in 1932. The next year, at 30, he graduated from the University of Montana in Missoula with a degree in history and began teaching there. Mr. Mansfield always said that his wife was responsible for his successful career. "She did the pushing and pressing that got me where I am today," he said in 1998. "I get the credit. She does the work. It isn't fair. She cashed in her life insurance to get me through school. She gave up her job as a high school teacher to follow me in my career." Mrs. Mansfield died last year. He is survived by their daughter, Anne Morris, and a granddaughter. As a popular professor of Far Eastern and Latin American affairs, Mr. Mansfield built up a network of former students, and they helped him throughout his political career. In his first campaign, in 1940, he finished last in a three-man primary for the Democratic nomination for a seat in the House of Representatives. But in 1942 he won a close contest for the First Congressional District seat vacated when Jeannette Rankin, a Republican, retired. In the decade he spent in the House, Mr. Mansfield's voting record included support for extensions of price controls, a higher minimum wage, the Marshall Plan to aid European recovery after World War II, economic aid to Turkey and Greece and immigration for people displaced in World War II. He opposed restrictions on labor unions, the peacetime draft, money for the House Un-American Activities Committee and the 22d Amendment, which limits presidents to two terms in office. When Mr. Mansfield challenged Senator Zales N. Ecton, a Republican, in the 1952 senatorial race in Montana, Senator Joseph R. McCarthy, the flamboyant Red hunter from Wisconsin, went to Montana to campaign for Mr. Ecton. Senator McCarthy said Mr. Mansfield was "either stupid or a dupe" of the Communists and was guilty of coddling them. But Mr. Mansfield won the Senate seat despite the landslide victory of the Republican presidential candidate, Dwight D. Eisenhower. Four years after entering the Senate, he was made assistant majority leader under Johnson. "I didn't want the job," he said in 1998, "but they kept insisting. Later I learned that they needed me because they didn't want an all-Southern leadership, so I took it. But Johnson did everything. I didn't have a thing to do. It was just a title." But when Johnson became vice president in 1961, Mr. Mansfield was in position to become majority leader. Although some of Mr. Mansfield's colleagues criticized his style as lacking in vigor, he resisted suggestions to be tougher. "In the first place, I couldn't do it," he said. "In the second, if I were to do it and I got away with it, the result would be temporary. Sooner or later they'd just tell you to go to hell and do what they wanted to anyway. I like to treat the members as I would like them to treat me." Mr. Mansfield was never known as an orator. But many Americans' sharpest memory of him is the brief eulogy in simple words and spare sentences he delivered for John F. Kennedy as the slain president lay in state in the Rotunda of the Capitol. The eulogy began: "There was a sound of laughter; in a moment, it was no more. And so she took a ring from her finger and placed it in his hands." After Johnson became president and steadily increased the American combat role in Vietnam, relations between him and Mr. Mansfield began to cool. Mr. Mansfield said the war in Vietnam convinced him that "Congress had handed its power over to the president on a silver platter" and for that reason he co- sponsored the war powers bill of 1973. Through his close friendships with many Asian leaders, Mr. Mansfield helped pave the way for President Richard M. Nixon's 1972 visit to China, the first step toward the restoration of diplomatic relations between the countries. But Mr. Mansfield criticized Mr. Nixon for continuing the war in Vietnam. When the Watergate scandal began to unfold in 1973, Mr. Mansfield became a leading opponent of the Nixon administration. "To excise Watergate and what it implies before it becomes fatal to liberty is a fundamental responsibility of this government," he said. "The people of this nation do not want government by the whim or the will of the most powerful and influential." He was a staunch advocate of gun control, an unpopular position with many voters in Montana. Nevertheless, they returned him to the Senate in 1958, 1964 and 1970, each time with a winning margin that exceeded 60 percent. Had he chosen to run in 1976 there seemed no doubt he would have won again. After serving in Japan, he returned to Washington at 85 and became a senior adviser on East Asian affairs at Goldman Sachs, the investment banking firm. President Carter first asked Mr. Mansfield to be ambassador to Mexico. But he turned it down, he said, because "Maureen doesn't like high altitudes." But because of his longtime interest in the Far East, he accepted the post in Japan. The Japanese, who especially respect diplomats who have been seasoned by age and experience, enthusiastically welcomed him to Tokyo. A newspaper carried an editorial headlined, "A Giant Walks Among Us." Mr. Mansfield's response was typical of him. "I'm no giant," he said. "I'm just a fellow embarking on a new career." On Friday, October 5, 2001. 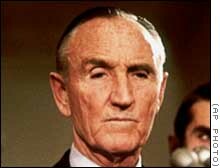 Senator MIKE MANSFIELD. Beloved husband of the late Maureen Hayes Mansfield; father of Anne Mansfield; grandfather of Caroline Marris; brother of John Mansfield. Friends may call at the MURPHY'S FUNERAL HOME OF ARLINGTON, 4510 Wilson Blvd., 2 to 4 and 7 to 9 p.m. Tuesday, October 9, Mass of Christian Burial will be offered 10:45 a.m. Wednesday, October 10, Ft. Myer Memorial Chapel. Guests attending are requested to assemble at the Chapel by 10:15 a.m. Interment Arlington National Cemetery with full Military Honors. Memorial contributions may be made to Maureen and Mike Mansfield Foundation, in c/o of University of Montana, Missoula, Montana.